Kunzang Dechen Lingpa Rinpoche (1928-2006) was a tertön of the Nyingma tradition of Tibetan Buddhism. Renowned in his homeland of Northeastern India, he was a realized master of Dzogchen. His terma texts include many profound practices, but especially a special healing Chö practice of Tröma Nakmo. Through this practice, he has been able to bring healing and relief from suffering to countless beings around the world. Kunsang Dechen Rinpoche was born in the Earth Snake Year (1928), in Southern Tibet in Lhodrak. 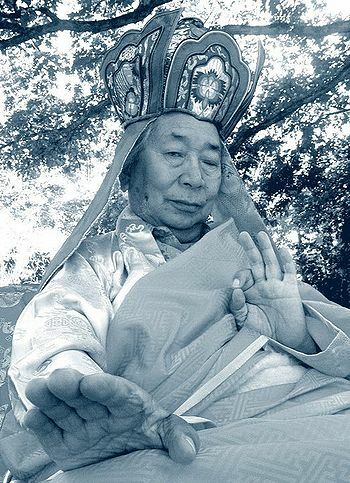 He was recognized by Dudjom Rinpoche as the Lodhak Tertön, the reincarnation of Tertön Longsal Nyingpo, of the Drupchen Melong Dorje lineage. From childhood he was only interested in spiritual things. At 16 he went into full time spiritual retreat, and studied with Dudjom Rinpoche for 10 years. Kunzang Dechen Rinpoche passed away in 2006, in Zangdok Palri Monastery. He remained in tukdam, sitting upright unassisted for two and a half days. At that time, marvelous signs were witnessed by many. This page was last edited on 19 May 2014, at 13:26.